Are an exotic fruit recognisable by their uniform golden yellow or orange colour. The persimon is a flavoursome variety of the traditional Classic persimon and is grown in Spain by a specially developed method. This gives it a firmer texture and it keeps for longer than other varieties. When persimons are fully ripe, the taste of the exquisite, refreshingly sweet, stone-free flesh resembles that of mangoes and peaches.
. These qualities have made Spanish persimons an increasingly popular autumn trendsetter. Moreover persimons are nutritious, have a high vitamin A and C content and, thanks to their high glucose levels, are a fantastic source of energy. Hachiya - the kind you can't. If you bite into an unripe Hachiya persimmon, it is if you just drank six cups of extra strength tea. 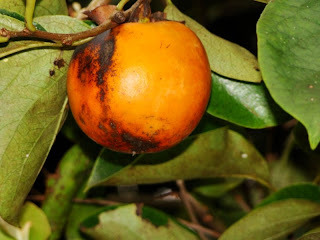 This astringent flavor is due to the high level of tannin in the fruit, and there is a good chance that you would never try a persimmon again because it tastes so bitter. This would be a shame because ripe persimmons have an exceptional flavor and provide us with important nutrients such as beta-carotene, Vitamin C and potassium.